Hotel Trend Asakusa ANNEX is a great place to stay in Tokyo . From one night to several nights staying, from one person to group, business use, tourism use etc. 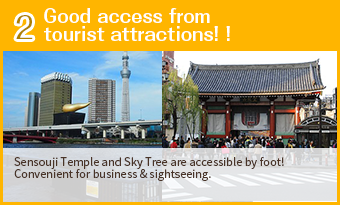 If you are looking for a budget accommodation in Asakusa area, choose Hotel Trend Asakusa !! "Hotel Trend Asakusa ANNEX" was newly opened on April 14th, 2018. Asakusa Station, Tsukuba Express Line is a 5-minute walk, and Sensouji Temple is a 5-minute walk away. As neighboring facilities, 5-minute walk (15 minutes by train) from Asakusa's new tourist spot, Tokyo Sky Tree, 5-minute walk to retro amusement park, Hanayashiki, and 3-minute walk to Asakusa entertainment hall. LAWSON Store is at 2-minute walk, and there are lots of restaurants in the neighborhood. The hotel is located in the middle of shopping streen with arcade, so you can get comfortably even on rainy day. With a heartful hospitality and smiles, we hope you have a pleasant stay with us. We look forward to your reservation. ※ A card is execluded. 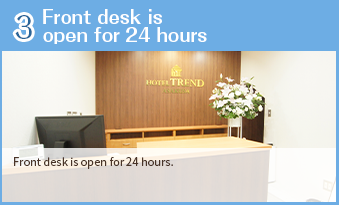 "Hotel Trend" is a hotel brand owned by Halcnic Corporation. © 2019 Hotel Trend Asakusa ANNEX All right reserved.